LANCASTER — College of the Canyons placed golfers in the top three individual spots on the way to winning its fourth straight conference tournament with a five-man score of 367 at Antelope Valley Country Club on Monday. 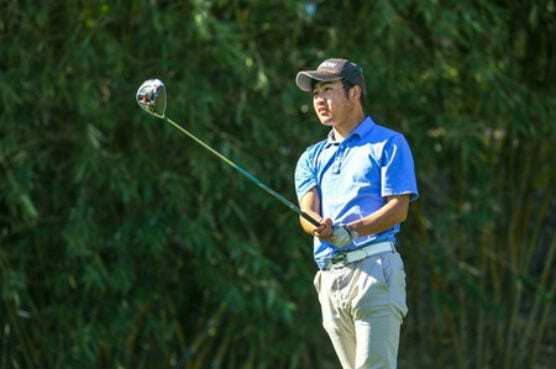 COC freshman Nobuhiko Wakaari (pictured above) was the tourney medalist for the fourth time this season with his three-under-par round of 69. He has now finished par or better in three of the last four events. Sophomore Matthew Mansholt finished as runner-up in the individual standings with an even-par score of 72. Mansholt had not competed for the Cougars since Feb. 25 but had a major impact on Monday’s results. Cougars freshman Tom Sims tied for third with a one-over score of 73. That left him even with Brennen Boulger of AVC, Scott Schuster of Glendale, and Jeff Rugg of Allan Hancock College. Anguerrand Voisin (76) and Jules Lavigne (77) were the other two golfers to score for Canyons. Jack Greene (83) had his round dropped. Santa Barbara City College finished second on the day at 380 to narrowly beat out third place Glendale (382) and fourth place Ventura (389). Canyons improved to 45-3 with the victory. SBCC remains in second place in the WSC standings at 43-5. The Cougars get back on the course Monday, March 25, at the WSC event hosted by Victor Valley College at Spring Valley Lake Golf Course in Victorville. Nobuhiko Wakaari (69)-Medalist; Matt Mansholt (72)-Second; Tom Sims (73)-Tie Third; Anguerrand Voisin (76); Jules Lavigne (77); Jack Greene (83). I’m disappointed you never mention COC golf coach Gary Peterson in these articles. It seems he is deserving of some credit.